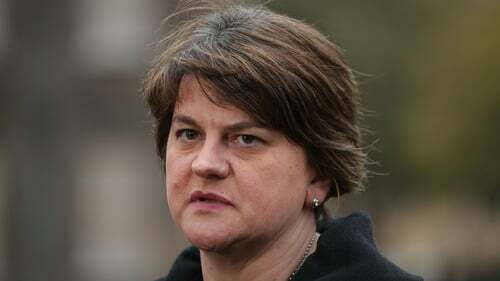 DUP leader Arlene Foster unlawfully mistakenly deferred a bid for extra funding for inquests into historic killings in Northern Ireland, a judge has said. Mrs Foster erroneously believed £150 million earmarked by the British government as part of the 2014 Stormont House Agreement to speed up coroner's hearings should await the outcome of an overall package dealing with all legacy issues, Belfast High Court judge Paul Girvan added. In 2014, the UK government announced £150m to support legacy reform in Northern Ireland, as part of a wider package of measures to address the legacy of the Troubles. In 2016, Northern Ireland's Lord Chief Justice Declan Morgan requested the cash be released to address a major backlog. A total of 54 inquests involving 94 deaths were covered. Mrs Foster refused to table a government paper for agreement by the power-sharing administration to petition the Northern Ireland Secretary for the funding, failing to discuss it with then deputy first minister Martin McGuinness, the judge said. Power-sharing collapsed in Northern Ireland more than a year ago and the inquest issue has not been resolved. Without resolution the UK faces yet again the "likelihood" of being found to be in breach of its Article 2 obligations to protect life and hold a speedy investigation into deaths, Judge Girvan said. Brigid Hughes took the judicial review. Her husband Anthony Hughes died in May 1987 when he was innocently caught in the cross-fire between soldiers and the IRA at Loughgall RUC station in Co Armagh.